Happy New Year! I can’t believe it’s already 2014! I rang in the new year with some friends at a party where we got really dressed up, played lots of games (including Gooey Louie… remember that game?!) and had a really great time. Pictures coming soon (I forgot the cord for my other camera in Milwaukee!). 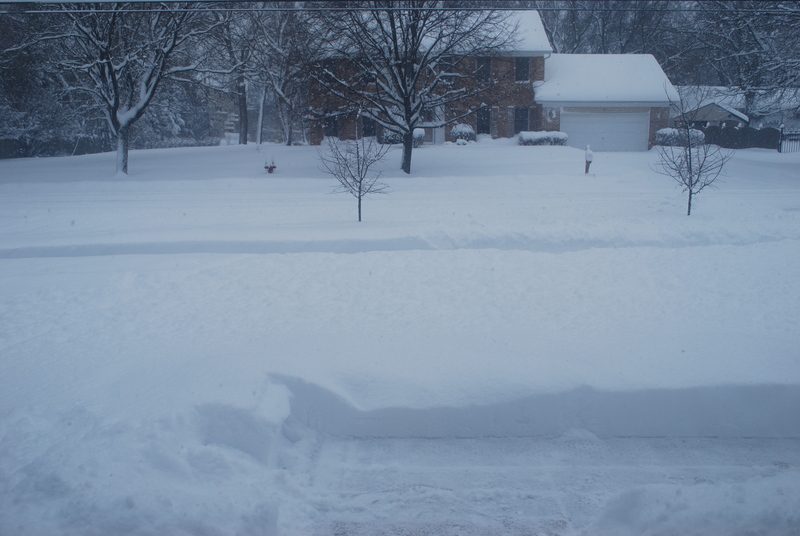 I love snow when I don’t have to drive in it. And luckily I had nowhere to be today! 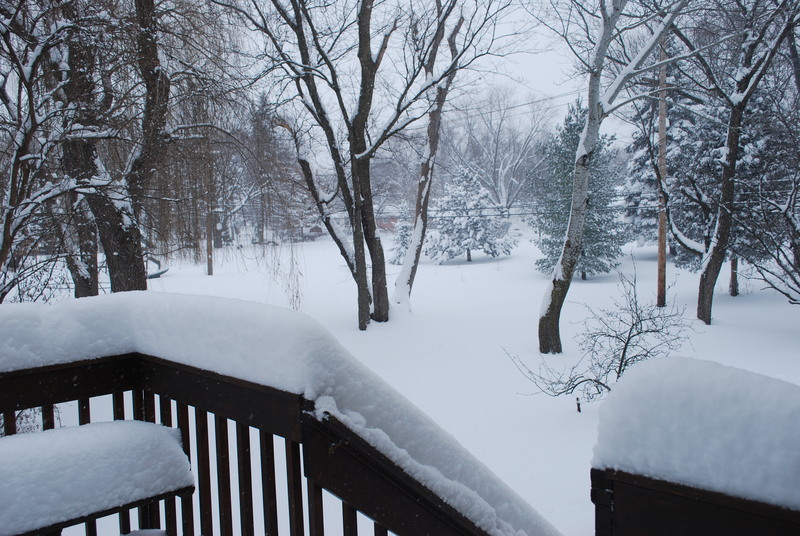 I just sat inside and enjoyed watching it fall. I start work again Monday so hopefully all the roads will clear up and the weather will improve by then. I drive a little Mini Cooper and Francois (my car) is NOT a fan of the snow. He slides around a lot and gets stuck going up my driveway. Poor thing. 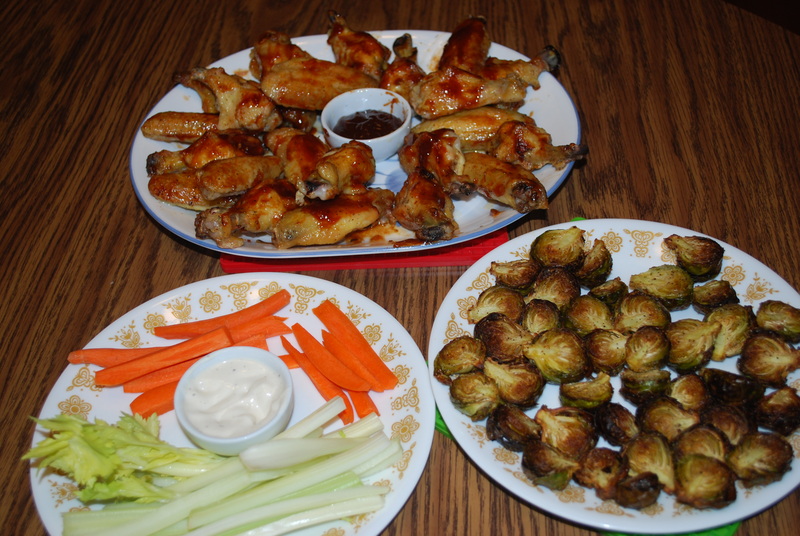 Tonight I have an easy dinner idea for you: Barbecue Chicken Wings with Roasted Brussel Sprouts and Brussel Sprout Chips. I never used to like brussel sprouts (although actually, I never remember trying them when I was younger), but now I adore them! 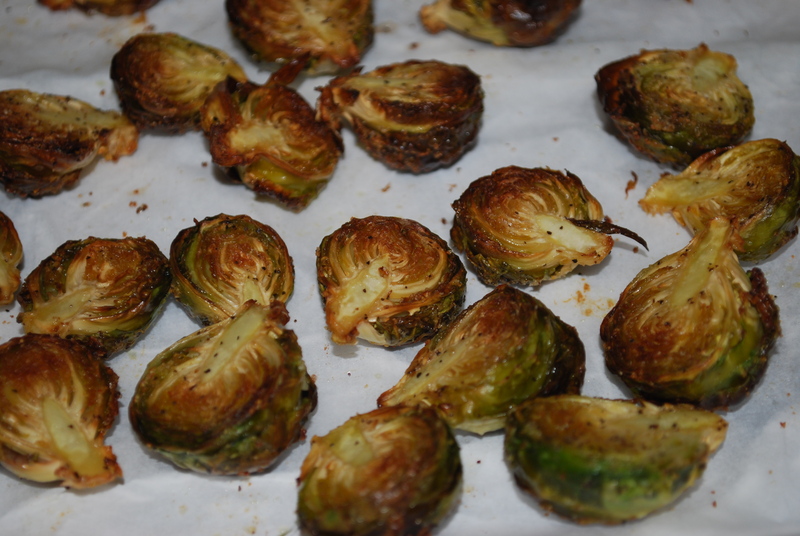 I roast them in the oven so they are nice and crispy and they make a very good side dish. There’s something I like even more than brussel sprouts, however, and that is brussel sprout chips. I take all of the outer leaves or ones that are a little loose and roast them for a few minutes and they become incredibly crispy, just like chips. My parents loved them as well; my dad couldn’t keep his hands off the chips! 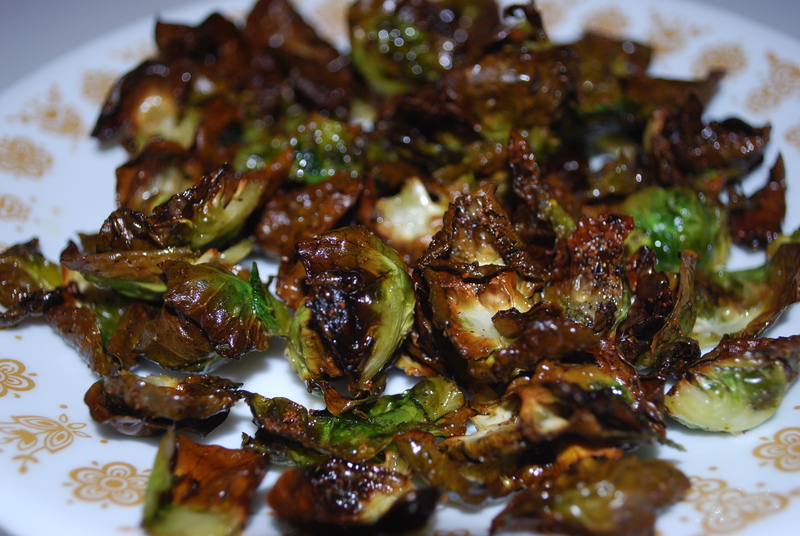 Even if you think you don’t like brussel sprouts, I encourage you to try them roasted – you might change your mind. This dish is so simple and perfect for a busy weeknight dinner. It doesn’t take a ton of prep and there aren’t many ingredients. Preheat your oven to 400 and line a baking sheet with wax paper. 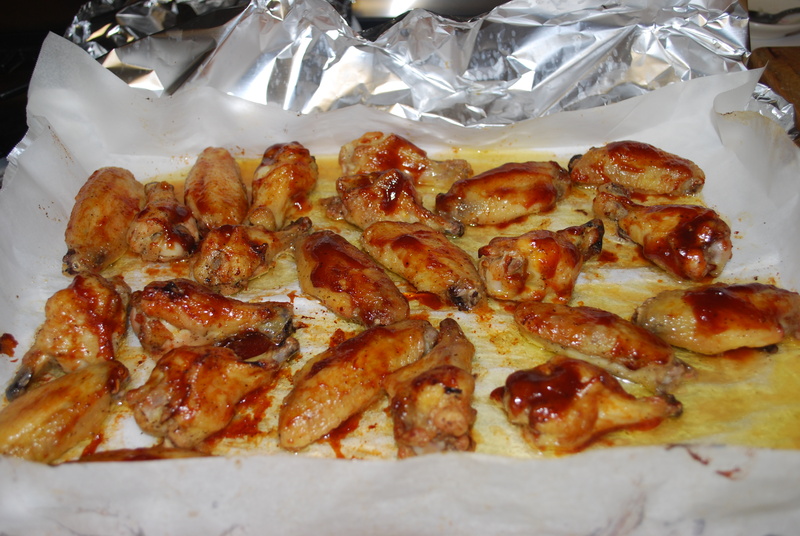 Rinse your chicken wings in cold water and pat them dry with a paper towel. I didn’t include any amounts in this recipe because you can use however many you want. It’s completely up to you! We used about 1 1/2 pounds of wings for 3 people (and had leftovers). Next, cut the tips off the wings and cut them at the joints so each wing becomes 2 separate pieces. You can buy them already cut or even have your butcher do it if you would like. Place the wings into a bowl and coat them with olive oil. Again, there is no specified amount, just make sure they are all coated. Season them with salt and pepper, then place on the baking sheet. Place in the oven and cook for about 50 minutes, or until crispy. 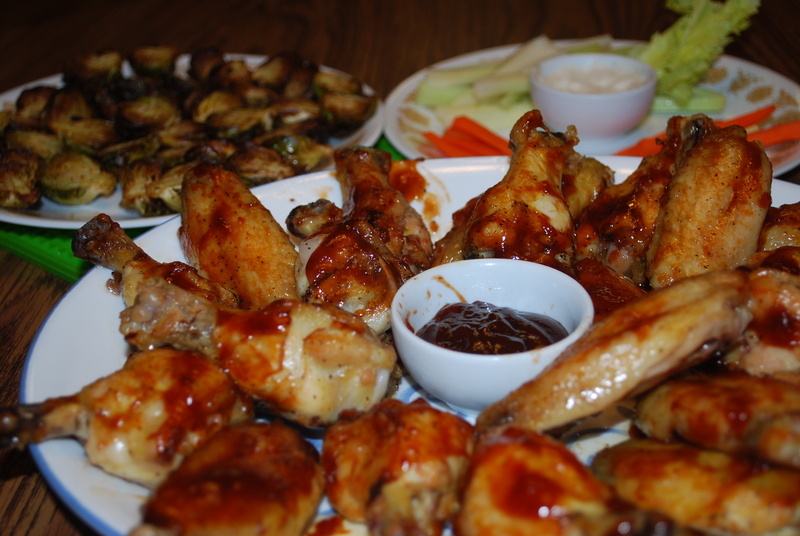 Take the wings out of the oven, then coat them with your desired amount of barbecue sauce. Place them back in the oven for another 10 minutes. 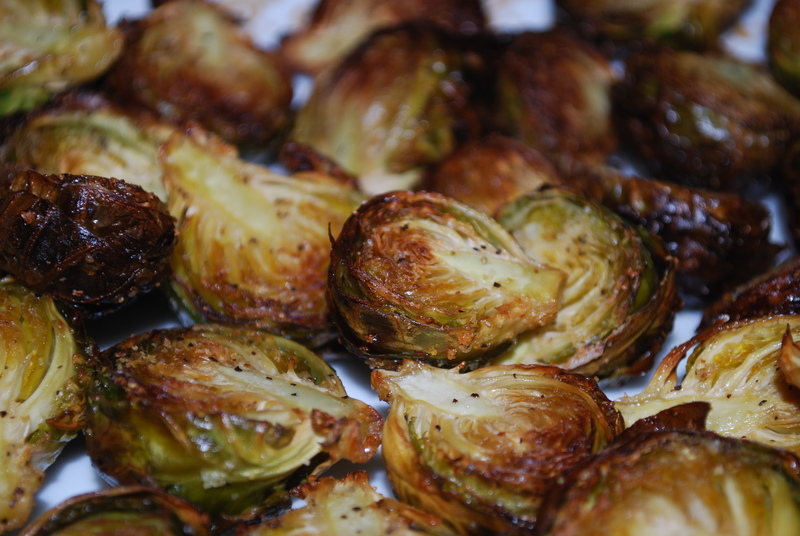 While the wings are cooking, prepare your brussel sprouts. Wash them, then remove the outer leaves. 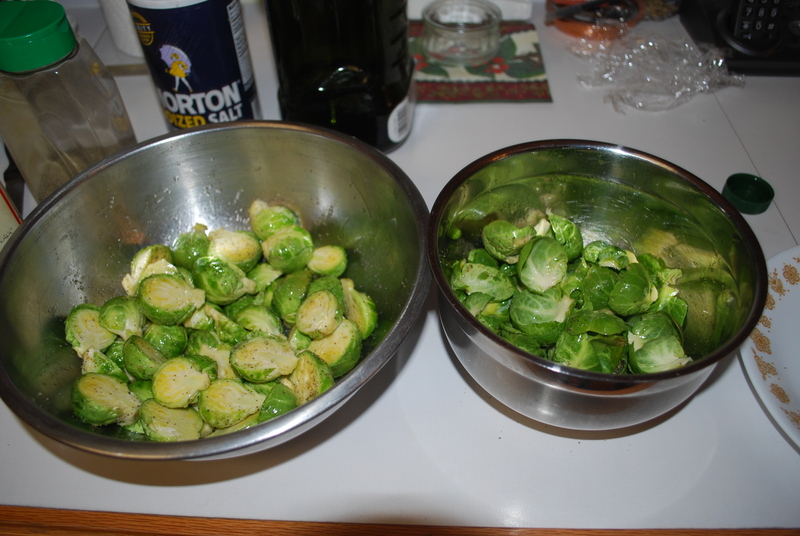 Place the sprouts and leaves in a bowl and coat with olive oil. Season with salt, pepper, and garlic salt. 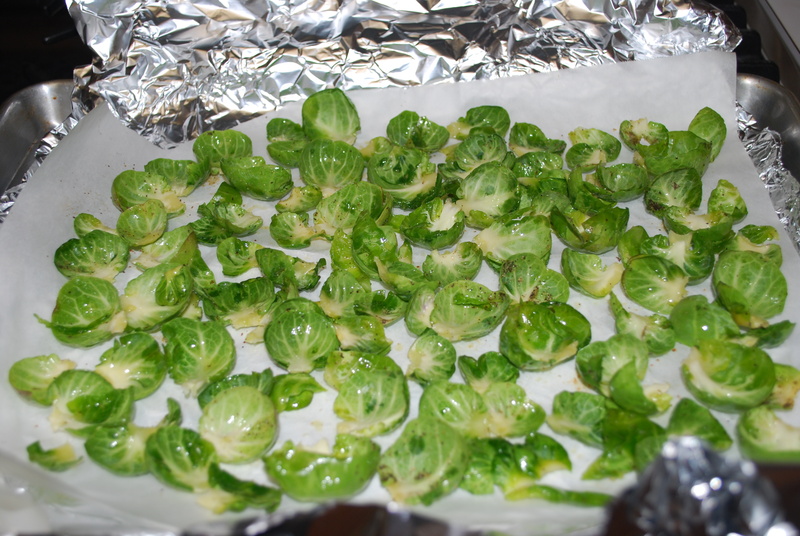 Place the sprouts on a foil or wax paper-lined baking sheet (save the outer leaves for afterwards to make the chips). 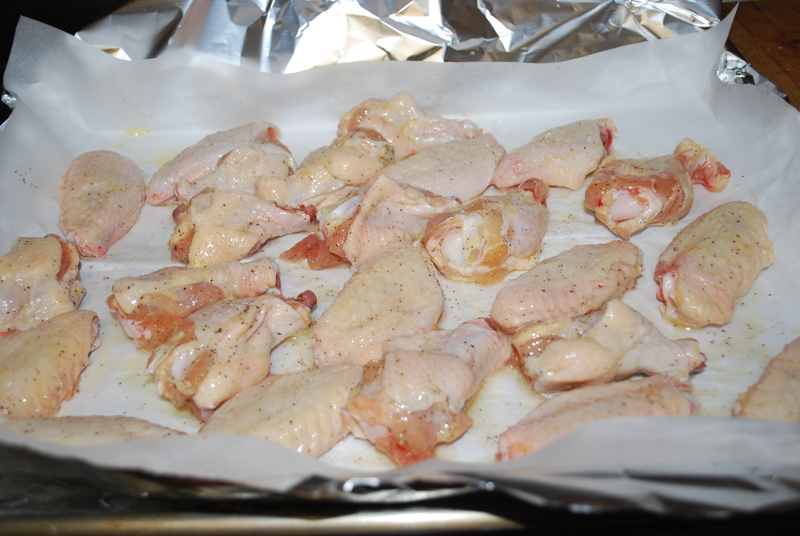 Once the wings are done, remove them from the oven, cover, and set aside. 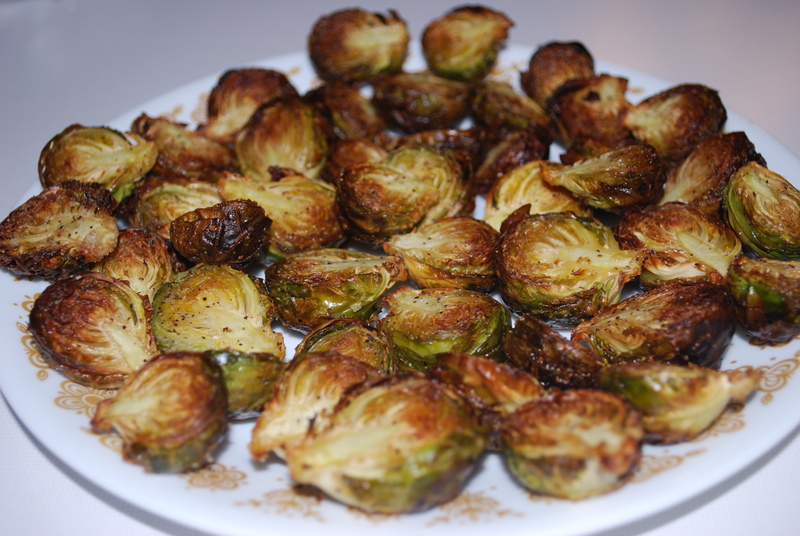 Place the brussel sprouts in the oven and roast for 15 minutes. 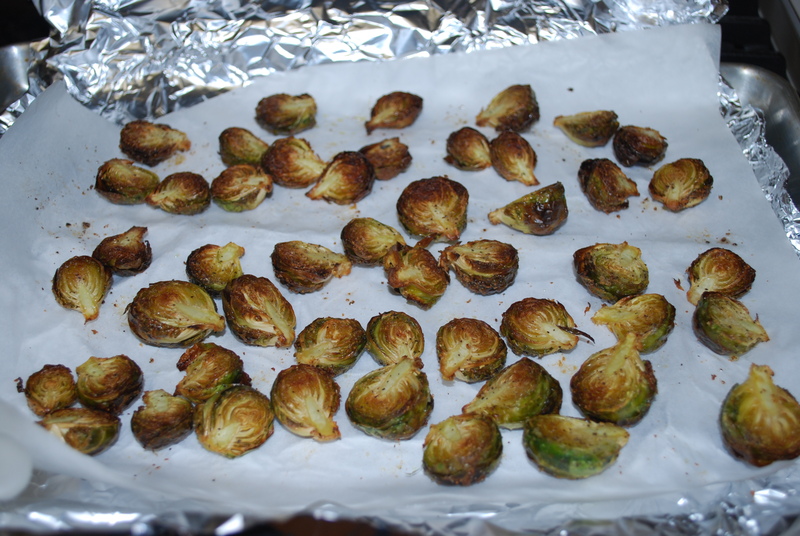 Remove the baking sheet, flip the sprouts, and place the sheet back in the oven for another 15 minutes or until the brussel sprouts are golden brown and crispy. 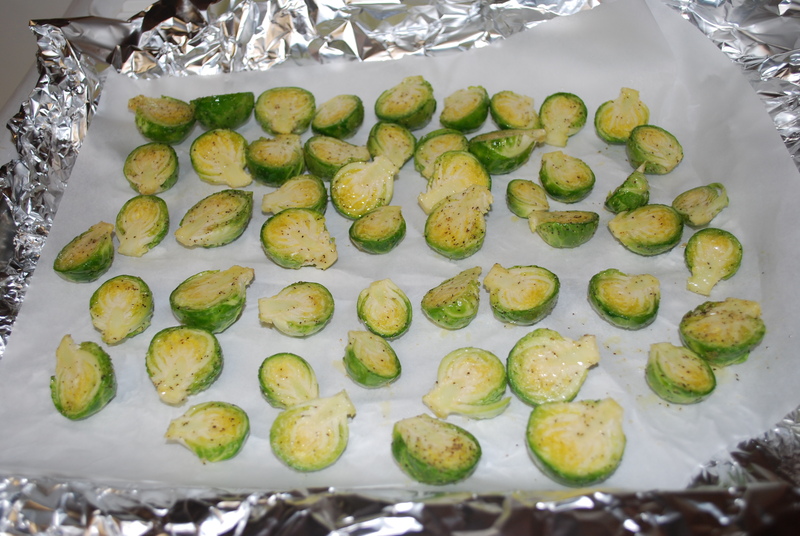 Remove the brussel sprouts from the baking sheet and place the outer leaves on the sheet. Roast them for about 5 minutes or until they are crispy. Rinse wings in cold water then pat with paper towel to dry. Cut tips off wings and discard, then cut them each at the joint. 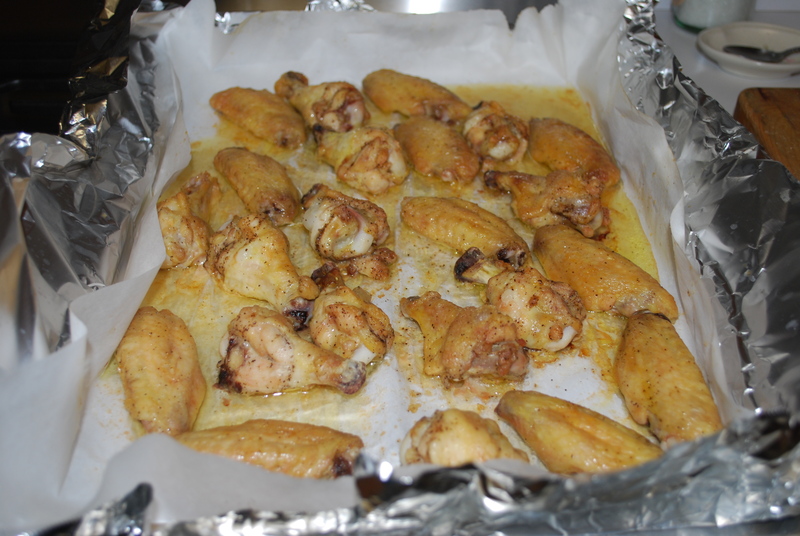 Place wings into a bowl and coat with olive oil. Season with salt and pepper and place in a wax paper-lined baking sheet. Bake at 400 degrees F for 50 minutes or until crispy. 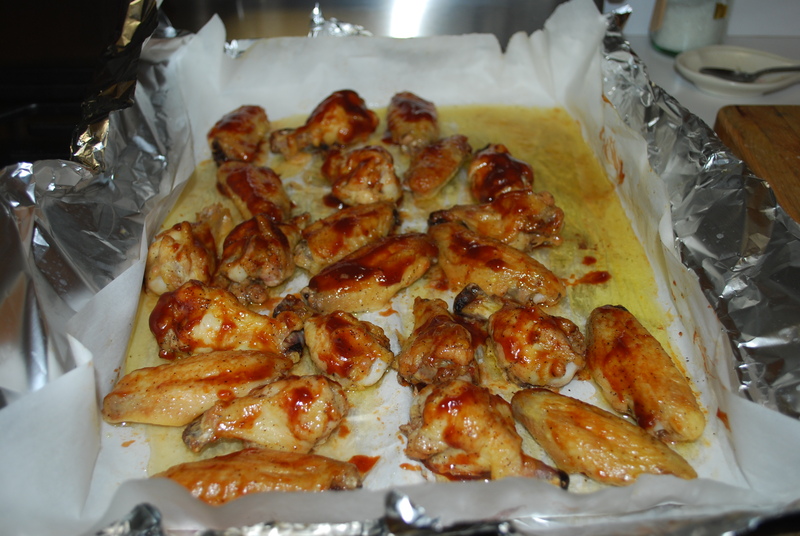 Take wings out of the oven and brush them with your desired amount of barbecue sauce. Bake for another 10 minutes. 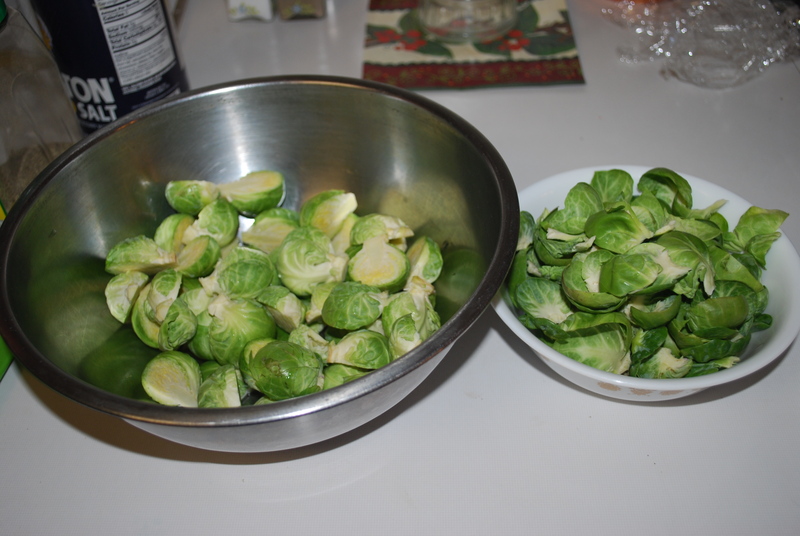 For brussel sprouts: wash sprouts and take off outer leaves. Cut sprouts in half. Place sprouts and leaves in a bowl and coat with olive oil. Season with salt, pepper, and garlic powder. 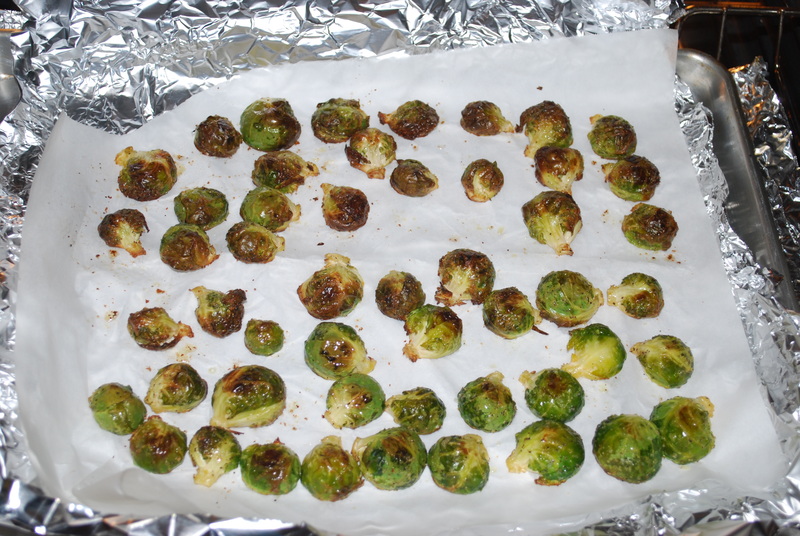 Place sprouts on a foil or wax paper-lined baking sheet and bake at 400 degrees for 15 minutes, flip, then cook for another 15 minutes, or until golden brown and crisp. 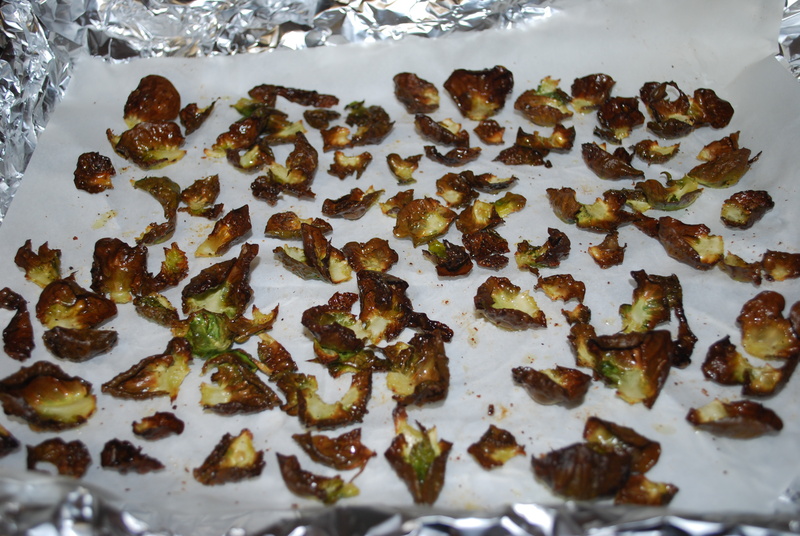 Remove the sprouts and place the outer leaves on the same baking sheet and cook for about 5 minutes or until crispy. 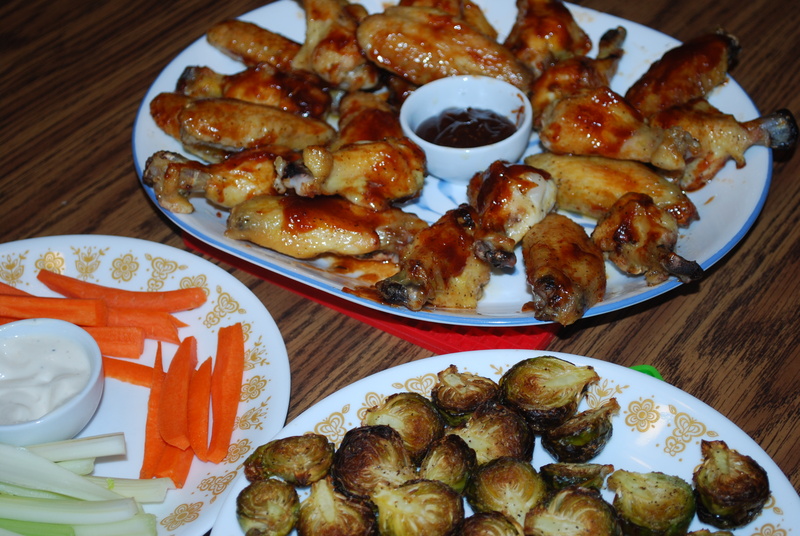 This entry was posted in Dinner, Sides and tagged barbecue, brussel sprouts, chicken wings, easy, roasted. Bookmark the permalink.